by Pixel Tucker Pty Ltd.
Colour me impressed. Installed this a few minutes ago and really really like it. It's a small download, low memory usage, simple and quite honestly gorgeous interface, clean, simple, light and just splendid. up and running in a few seconds after logging in with my details. Apparently this is called a "simple" client, but honestly, I can't think of anything that it doesn't do that I'd like it to. 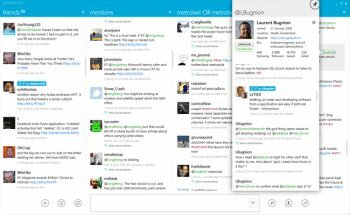 If you've used Tweetdeck or Seesmic or Gwibber or Hotot or any of the many many desktop clients around, the 3 pane client will be familiar to you, but I think this seems the nicest looking, the most responsive, the quickest, the nicest desktop Twitter client I've used on either Linux or Windows. I just wish that many more apps would look this good and work this well. I really really like this application, it's got that special "something" that makes me really enjoy using it. Simple twitter client, that looks good. It runs in dot.net 3.5. It is still a young client, because the lag that is sometimes affiliated with this. Still replaced my desktop client.